The time has come to build the enticing outdoor living space that you’ve always wanted. You aren’t alone in your thinking, as more than 80 percent of folks surveys by Houzz recently said they were looking to add a deck or patio. With there still being several months of beautiful weather ahead, now is the perfect time to consult a local deck builder. 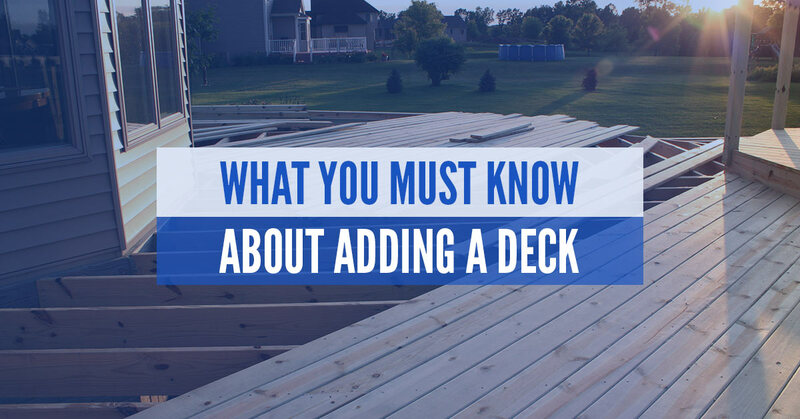 In this blog post, we will explain what you must know prior to installing the deck of your dreams. Determine what you want your deck to do – A deck is a great way to spend more time outside with friends and family. In addition to your deck, maybe you also plan on adding a fire pit, kitchen, hot tub, outdoor TV, and furniture. With that in mind, don’t forget about privacy. Consider some sort of arbor, pergola, latticework, or something else to ensure privacy as you enjoy your deck. Make sure you can easily access your deck – This can either be really easy or really difficult. For example, do you already have a door that leads outside to where you’ll want your deck? If that’s the case, then you’re in good shape. However, some homeowners are forced to add an opening for a door, which can play a major factor in cost. Remember, too, that you’ll ideally want your deck as close to the kitchen as possible. Don’t overlook design – It’s great to have a deck that you can call yours, but that doesn’t mean you should downplay how it looks. Deck installers typically have options ranging from composite to wood, so be sure to ask about design materials. It’s important to know that the upkeep can be different based on the material you choose. Have some type of covering in mind – Your deck should serve as a bit of an oasis. That means having a plan to combat the hot sun and any potential storms. The possibilities are endless here, from retractable awnings and pavilions to pavilions and screened-in porches. Most importantly, be sure to pick a dry, shaded area for your deck so that this step becomes easier. Do plenty of research on cost – Not surprisingly, the cost of deck design, labor, and materials varies by location. Cost can range from several thousand dollars to upwards of $30,000 depending on locale in the United States. Go with a professional outdoor deck builder – It’s easy to talk yourself into thinking that your deck can be a DIY project. However, a deck contractor is the safest bet. He or she will meet with you, take site measurements and photos, and talk with you about your needs. Not to mention, they can make design suggestions and provide insight regarding local building codes. When you consider that 65 percent of all decks are built by homeowners trying to save money, it makes sense to try taking on the project without a professional. But as we mentioned in a previous post, deck additions can recoup nearly 80 percent of the cost at resale. Therefore, it’s wise to put your trust in decking companies. Since 2001, the local deck builders at Ready Decks have provided the highest quality site-built decks in the shortest time possible while offering homeowners the greatest value. Ready Decks is committed to providing the ultimate consumer experience through quality, value, and integrity. With multiple locations across the U.S., it’s easy to find a Ready Decks near you. Call us today to ask about financing options.